Almost two of every 1000 Americans do not have steady access to shelter, the U.S. Department of Housing and Urban Development (HUD) estimates. That’s approximately 565,000 people — a number that grew after the Great Recession and has started to decline, HUD says. Of those, over 83,000 are considered chronically homeless. These, the most-desperate cases, are mostly individuals with a disability who have been on the streets for over a year or suffered four or more episodes of homelessness over the past three years. People with serious mental illness are over-represented among this group, partly a result of the closing of many mental hospitals in the last 40 years, write Michelle Patterson and colleagues in a 2013 paper for Social Psychiatry and Psychiatric Epidemiology. Alcohol abuse also is common among this group. But since 2010, chronic homelessness has declined 22 percent (whereas homelessness overall has fallen 11 percent). One nationwide program associated with lower rates of chronic homelessness is Housing First. An alternative to temporary shelters, Housing First (HF) provides the chronically homeless with immediate access to permanent, independent housing. This housing is not contingent on meeting milestones, such as sobriety, but the program provides support for other challenges such as alcohol abuse. Before HF was introduced in New York in 1992, assistance throughout the country was generally granted only in stages to homeless people with substance abuse problems or mental illnesses. They had to progress first through therapy, treatment and transitional housing, to prove they were “housing ready.” HF flips this model, first offering the housing and then the treatment, specifically targeting chronically homeless individuals with mental illness. Several randomized controlled trials document how HF is more successful than traditional interventions in keeping this group off the streets, though there is little association with a decrease in substance abuse. This marks a policy paradigm shift, and the lack of moralizing has been widely embraced as effective for the vast majority of chronically homeless. HF was adopted by the George W. Bush administration in 2004, a move that surprised researchers Victoria Stanhope of New York University and Kerry Dunn of the University of New England, they write in a 2011 review for the International Journal of Law and Psychiatry. The effectiveness of HF, they argue, is partially in its narrow claims: its proven success helping this extremely marginalized group. The United States Interagency Council on Homelessness, which is chaired by the secretary of the Department of Health and Human Services, has a detailed fact sheet on the program. The National Alliance to End Homelessness, an advocacy group, also endorses it. HF also has been implemented in dozens of American cities — from Seattle to Salt Lake City to Cleveland — in Canada, parts of Europe, Australia and New Zealand. Advocates for HF (which is sometimes known as Pathways Housing First, after the organization that chartered the technique in New York) argue that the program costs taxpayers less because participants are less likely to use expensive emergency services, such as shelters, hospitals and jails. The Colorado Coalition for the Homeless, a non-profit, calculated in 2006 that HF saves $15,750 per person per year in expenses. A randomized controlled trial published in Psychiatric Services in 2015 finds significantly greater chances that participants in HF programs in five Canadian cities will remain in housing after one year, compared with “treatment-as-usual” groups. Studying 950 homeless with severe mental illness, Tim Aubry of the University of Ottawa and colleagues find that while 69 percent of treatment-as-usual participants were not stably housed after one year, 27 percent of the HF participants were back on the streets. The HF participants “reported greater gains in quality of life, and demonstrated greater improvements in community functioning compared with participants in treatment as usual.” “These findings suggest that a majority of individuals with severe mental illness who are homeless are able to move immediately into and manage their own housing if given the right supports,” writes Aubry. The 2013 Patterson study in Social Psychiatry and Psychiatric Epidemiology, notes significant increases in quality of life for participants after both six months and one year, compared with standard interventions. HF programs are beginning to appear outside of major cities. Pathways Vermont, an offshoot of the non-profit Pathways that originally started the program in New York, saved money on follow-up consultations with participants who were spread across a vast geographic area by purchasing computers for them and communicating via the internet. Pathways Vermont’s researchers saw a housing retention rate of 85 percent over three years, they report in The American Journal of Public Health (2013). 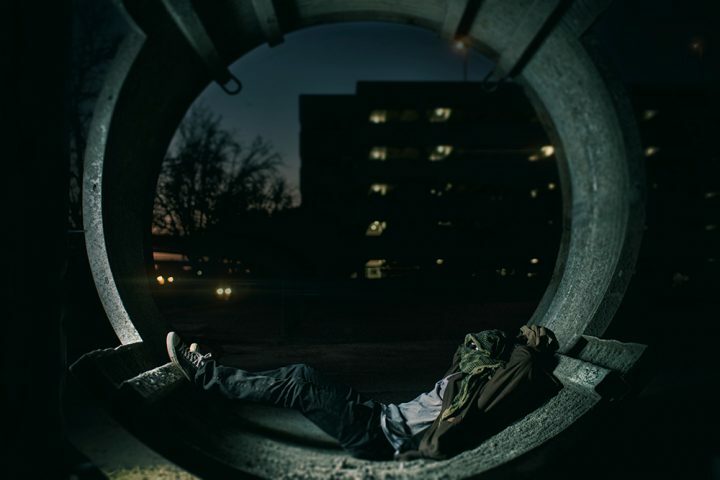 Chronically homeless people are associated with higher rates of alcohol abuse than the population at large, as well as higher rates of suicidal thoughts (43 percent compared with 10 percent) and attempted suicide (involving alcohol 80 percent of the time). Writing in Suicide and Life-Threatening Behavior, the peer-reviewed journal of the American Association of Suicidology, a team of researchers led by Susan Collins of the University of Washington finds that participants in HF programs were 55 percent less likely to attempt suicide; and 67 percent less likely to find thoughts of suicide interfering with daily routines. Some scholars argue HF does too little to address alcohol and drug abuse. Others point out that much of the scholarly research into HF’s effectiveness has been performed by a small cadre of academics, of whom many are tied to Pathways Housing First. A 2013 review of previous HF research published in The Journal of Sociology and Social Welfare describes flaws in the research including such conflicts of interest, but also a lack in methodological rigor. This “failure to collect data consistently across experimental conditions,” along with other problems, weakens assessments of the programs. The same review notes that while there has been no evidence HF increases substance abuse or psychiatric symptoms, the program does little to address them. A group of scholars from the University of Alabama at Birmingham praise HF in a 2009 study for the peer-reviewed Milbank Quarterly, but maintain that policymakers must not generalize the program’s successes. The authors suggest that traditional programs are better at addressing addiction, but notes that HF has a better track record in housing retention. HF is associated with decreased public funding for homeless programs, and reduced alcohol-related harm, report Seema Clifasefi and colleagues in the Journal of Community Psychology, 2016. But Clifasefi warns that the program cannot be seen as a cure for alcoholism and calls for more assistance for alcoholics living in HF units. The U.S. Department of Housing and Urban Development publishes a yearly census of the homeless population. The United States Interagency Council on Homelessness coordinates the government’s response to homelessness. The U.S. Department of Veterans Affairs has programs to tackle homelessness among the veteran population. The National Alliance to End Homelessness is an advocacy group in Washington, D.C., as is the National Coalition for Homeless Veterans. In addition to these government agencies and advocacy groups, many regions have their own shelters and nonprofit organizations that address homelessness — for example, Pathways to Housing Pennsylvania. Some programs have grown out of the Pathways Housing First model, started in New York by Sam Tsemberis, a psychiatrist at Columbia University. Tsemberis has since started his own advocacy and research organization, Pathways Housing First, which does not provide housing. Journalist’s Resource has published a number of articles reviewing literature on specific aspects of homelessness, such as homeless veterans and homeless sexual minorities. We also have a post on demographic trends. Aubry, Tim; et al. “One-Year Outcomes of a Randomized Controlled Trial of Housing First With ACT in Five Canadian Cities,” Psychiatric Services, 2015. doi: 10.1176/appi.ps.201400167. Clifasefi, Seema L.; et al. “Housing First, But What Comes Second? A Qualitative Study of Resident, Staff and Management Perspectives on Single-Site Housing First Program Enhancement.” Journal of Community Psychology, 2016. doi: 10.1002/jcop.21812. Collins, Susan E; Malone, Daniel K.; Clifasefi, Seema L. “Housing Retention in Single-Site Housing First for Chronically Homeless Individuals With Severe Alcohol Problems.” American Journal of Public Health, 2013. doi: 10.2105/AJPH.2013.301312. Collins, Susan E.; et al. “Suicidality Among Chronically Homeless People with Alcohol Problems Attenuates Following Exposure to Housing First.” Suicide and Life-Threatening Behavior, 2016. doi: 10.1111/sltb.12250. Groton, Danielle. “Are Housing First Programs Effective? A Research Note.” The Journal of Sociology and Social Welfare, 2013. Johnson, Guy; Parkinson, Sharon; Parsell, Cameron. “Policy shift or program drift? Implementing Housing First in Australia.” Australian Housing and Urban Research Institute Final Report, 2012. ISSN: 1834-7223. Patterson, Michelle; et al. “Housing First improves subjective quality of life among homeless adults with mental illness: 12-month findings from a randomized controlled trial in Vancouver, British Columbia.” Social Psychiatry and Psychiatric Epidemiology, 2013. doi: 10.1007/s00127-013-0719-6. Stanhopea, Victoria; Dunnb, Kerry. “The curious case of Housing First: The limits of evidence based policy.” International Journal of Law and Psychiatry, 2011. doi:10.1016/j.ijlp.2011.07.006.